A link to a 1981 12v Train poster was posted on LUGNET recently. This is a very cool poster which shows how extensive the 12v Train line was back in the early 1980’s. 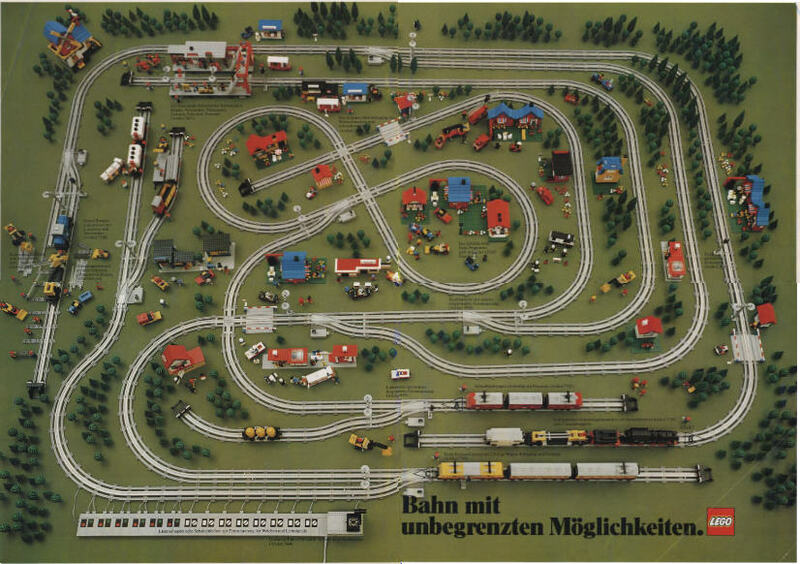 Although this is a pretty cool poster, the track layout isn’t very practical as there are no real loops but it does highlight all of the elements of the 12v Train System. One thing I have always liked about the 12v trains (and I only have one of them) is the points configuration allows the train track run very close together which means parallel tracks don’t require as much space as they do with 9v. I never understood why the 9v points space the track out by 8 studs. There aren’t too many things I’d still like to have for my Train collection but I would love to find a 7740 Inter-City Train sometime. Secondo me ci sono troppi binari, la cosa più importante è la citta, nn il treno! I did a search for track and found this. myself and brother had these tracks in 80s, i recently reset them up and rebuilt the 7740 set plus the sleeper and mail car. It pulls the whole thing easily and is a way better system than the new ones, especially controls of points, breaking zones and crossings. The 12v system had so many features… At least, in the beginning. By the mid 80’s, several of the remote control features seen earlier were hard to come by. It’s a pity nothing like this was ever actually developed. As for the battery system, I’ve never played with one of the 9v battery trains, but what I’ve heard of them doesn’t sound that brilliant.